The AutoPROM is a complex device and it can be confusing to get up and running. This guide is intended to get you to the point where you are connecting to a vehicle and able to use its functions. Before continuing with this guide, make sure you have the computer that you wish to use with the AutoPROM and the AutoPROM itself handy. For the remainder of this guide, we will use the terms “APU1” and ‘AutoPROM’ interchangeably. There is a series of videos on our YouTube channel that explain some of the basics. This guide covers a little more material but feel free to look at the videos before continuing. 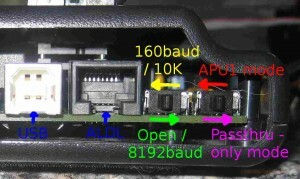 The AutoPROM uses a USB connection to talk to your PC. It uses the same FTDI drivers that all of our other products use. The first step in getting the AutoPROM working is to get your PC to recognize it. Turn on the computer you want to use with the APU1 and plug the APU1 in to a free USB port. Follow the instructions in the USB troubleshooting guide to ensure the device is recognized by Windows. Although it is mentioned in the guide above, make sure the APU1 is using a COM port between 1 and 8! This is CRITICAL for some older software. The rest of the troubleshooting guides in this guide will assume that you have basic USB connectivity. Each way you can use the APU1 will now be discussed. Refer back to the picture above if you are unclear from the description in each section. The APU1 can be used to program chips. It functions almost identically to the BURN1/BURN2 products that we sell, using the same software and procedures. Make sure the 28 pin ribbon cable used for emulation is UNPLUGGED from the unit. Unpredictable behavior can result from the APU1 being directly connected to a ECM using the emulation cable while burning chips. Make sure the outer horizontal switch is ‘towards the USB port’ position. (APU1 mode. Other position is passthrough mode, identical to ALDU1). Chip programming software will NOT be able to connect to the AutoPROM unless this switch is set correctly!!! Fire up TunerPro RT or Flash n Burn software. Your APU1 should be recognized and you should be able to program chips. If the APU1 is not recognized by software, try moving the mode selection switch again. Verify the the USB is being recognized correctly. The APU1 can be used as a real time chip emulator. It functions almost identically to the Ostrich/Ostrich2 products that we sell, using the same software and procedures. Make sure there is nothing in the ZIF socket. Emulation will NOT work reliably unless the ZIF socket is empty!!! Make sure the outer horizontal switch is ‘towards the USB port’ position. (APU1 mode. Other position is passthrough mode, identical to ALDU1). Emulation software will NOT be able to connect to the AutoPROM unless this switch is set correctly!!! Fire up TunerPro RT or EmUtility software. Your APU1 should be recognized and you should be able to upload a tune to it. The APU1 can be used for datalogging while simultaneously performing chip emulation. When used in this manner it is the most capable tools that we sell for tuning OBD1 GM Vehicles. Fire up TunerPro RT or Flash n Burn software. Your APU1 should be recognized and you should be able to upload tunes. Next, Tab over to the Data Acq. /Emulation tab. 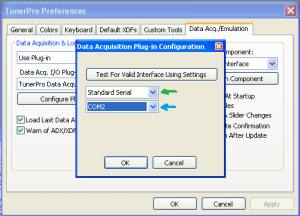 (red arrow) Make sure that “AutoProm/MAFTPro” is selected for Interface Type. 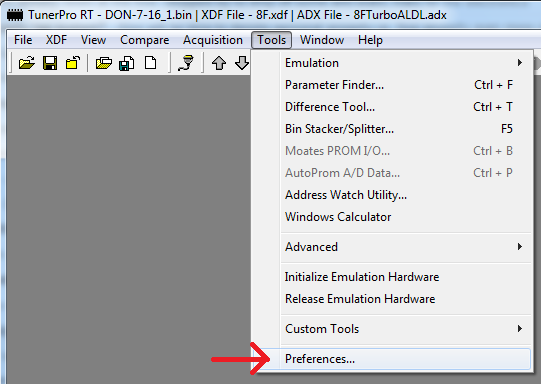 Make sure you have the correct XDF and ADX file loaded for your vehicle, plug everything in and give it a go! If you have trouble connecting, check the other switch on the APU1. Older applications that use 160baud require the in/up ”10k across A-B” setting. Later TPI, LTI and TBI applications use 8192 baud which requires the switch to be in the out/center =”open between A-B” position. If you just want to check codes, the down position will cause codes to flash. As you have seen above, the APU1 is a versatile device that can be used for many purposes. However TunerPro is the only software that knows how to use any of the advanced features of the APU1, so it is necessary to put the APU1 into a “pass through” mode when using other software. In these cases, the APU1 functions solely as an ALDL logging interface. Make sure the APU1 is connected to your PC and has a COM port between 1 and 8. It will be necessary for you to know which COM port the APU1 is using to configure it properly. Make sure the outer horizontal switch is ‘away from the USB port’ position. (Passthrough mode, identical to ALDU1. Other position is APU1 mode for TunerPro.) Legacy software will NOT be able to connect to the vehicle unless this switch is set correctly!!! We’re going to walk through the TunerPro RT configuration steps to use this mode. Your APU1 will NOT be recognized by TunerPro RT software in this mode. If you’re not using TunerPro, skip to step 9. If the APU1 is recognized by software at startup, try moving the mode selection switch again. Verify the the USB is being recognized correctly. Next, Tab over to the Data Acq. /Emulation tab. (red arrow) Make sure that “Use Plug-in” is selected for Interface Type. 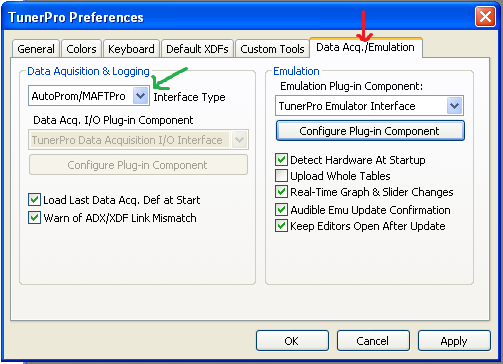 Make sure “TunerPro Data Acquisition I/O Interface” is selected under the component drop down box. 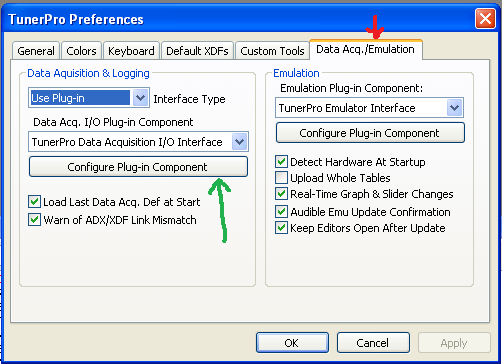 Then click the “Configure Plug-in Component” box (green arrow). Very early editions of this unit feature a different switch configuration. These units have a horizontal switch and a vertical switch. For the horizontal switch, outbound is passthrough mode and inbound is APU1 mode. The vertical switch has three positions. It controls the behavior of the datalogging interface, much like the inner switch on newer models. 10k is the up position, open is the middle position, and short (check codes) is the down position.